If you think about vanilla, you immediately start to imagine delicious ice creams, cakes and other yummy sweets. But where does this vanilla come from? Well, it is extracted from the fruits (beans or pods) of orchid vines, producing an intense aroma resulting from a complex of molecules. These orchids belong to the genus Vanilla (Orchidaceae), a diverse group of climbing hemi-epiphytes growing around trees with their aerial roots. The genus contains over 100 species and is pantropic, meaning that they are present all around the tropics. However, the aromatic vanilla species, the ones that produce the lovely smelling pods, are native to the Neotropics. Nevertheless, when you buy vanilla and take a further look at the country of origin, you will probably read “Madagascar.” But Madagascar does not fall within vanilla’s native growing regions, so only the introduced species that was brought over from Mexico a long time ago, Vanilla planifolia, is cultivated in Madgascar. 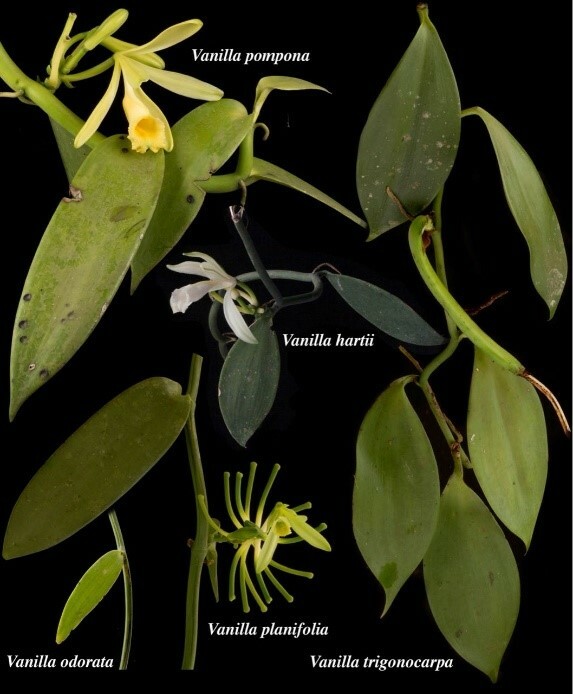 Vanilla cultivators in Madagascar have to pollinate flowers by hand, because natural pollinators are absent, and use intensive production systems. Furthermore, the market chain involves several intermediaries that keep prices artificially high by holding back large quantities, explaining the currently high market prices. As a result, we realized there is a need for innovation in vanilla cultivation. We want to determine the possibility of contributing to a more sustainable vanilla provision through a joint land sparing and land sharing approach (SPASHA), ensuring the conservation of wild vanilla populations while cultivating the economically interesting ones in a sustainable agroforestry system. There are several wild vanilla species, known as crop wild relatives (CWR), growing in the lowland tropical rainforests of the Neotropics, with presence of pods (that smell very nice! ), indicating natural pollination. However, there is very little known about the distribution, biology and ecology of both the orchids and their pollinators. We are interested in determining the potential to cultivate wild vanilla and therefore create an alternative income source for local communities. As part of the study, we made experimental plots, where we planted four aromatic vanilla CWR—V. hartii, V. odorata, V. pompona and V. trigonocarpa—in both reforestation areas and organic cacao plantations. One of the plots is located at Osa Conservation’s Osa Verde Agroecological Farm. We will measure growth and survival rate over time, as well as production and pollination processes during later stages. We will be monitoring the vanilla’s success over the next few months and keep you updated with the first results of this exciting (and delicious) research!